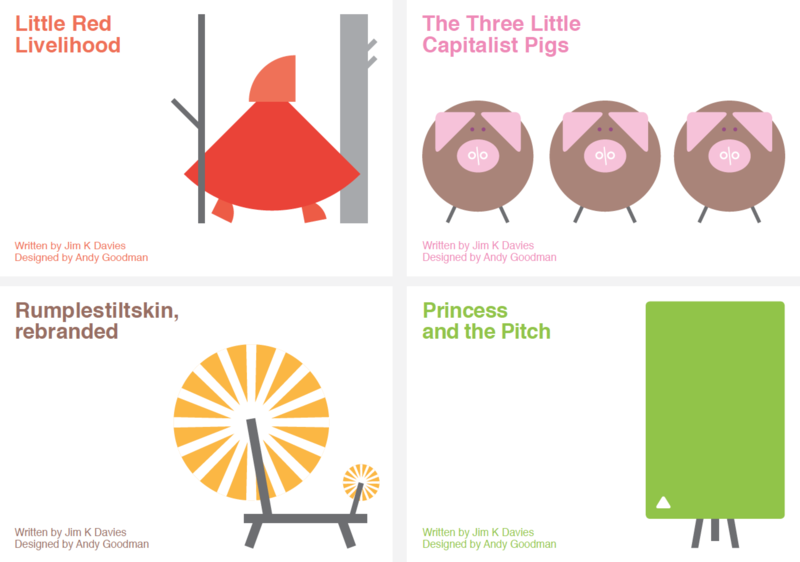 Totalcontent | Grimm Bros Inc. presents … business fairy tales. Home » blog » Grimm Bros Inc. presents … business fairy tales. In many ways, business jargon keeps me in business. I’m like a pest controller, brought in to exterminate added-value, fully leveraged, synergistic language. My mission is to dollop a bit of warmth and humanity over corporate double-speak, to help it ditch the red braces and pin-stripes, and maybe dress down with a polo shirt and a pair of Levi’s instead. So yes, on the one hand, I despise it. But on the other, it pays for my felt-tip pen habit. More than anything though, I find corporate lingo hilarious (or maybe laughable). And that’s why I asked designer and illustrator Andy Goodman to collaborate with me on four illustrated tales, in which the quaintly traditional language of fairy tales collides with the bombast of best-of-breed business jargon. Everyone knows fairy tales. Which means the fairy-tale teller can take liberties. They can reimagine them, subvert them, and play with expectations. Every small deviation from the original becomes a deliberate creative decision. In our profit-oriented tales, the storylines never fail to deliver an enchanting-yet-entrepreneurial ending. Wolves strike brutishly hard bargains, and princesses propose enterprising new businesses. Andy’s pared-down graphics add another dimension. His illustrations are direct and striking, but laced with subtle wit. The images dramatise the words using simple shapes and flat colours. These refer to the visual language of commerce — charts, graphs, infographics etc. For instance, Little Red Livelihood is mainly made up of pieces of a pie chart; the mountainous terrain in ‘Rumplestiltskin Rebranded’ is expressed as the peaks and troughs of a graph line; the wolf (above), covered in crisp, white bedclothes, resembles a chart on a downward trajectory. ‘Little Red Livelihood’, the first of our ‘classic fairy tales that mean business’, has just been printed and released. We’ll be launching the second, ‘The Three Little Capitalist Pigs’, in a couple of months. And there are two more tales — ‘Rumplestiltskin Rebranded’ and ‘The Princess and the Pitch’ — currently in the works. 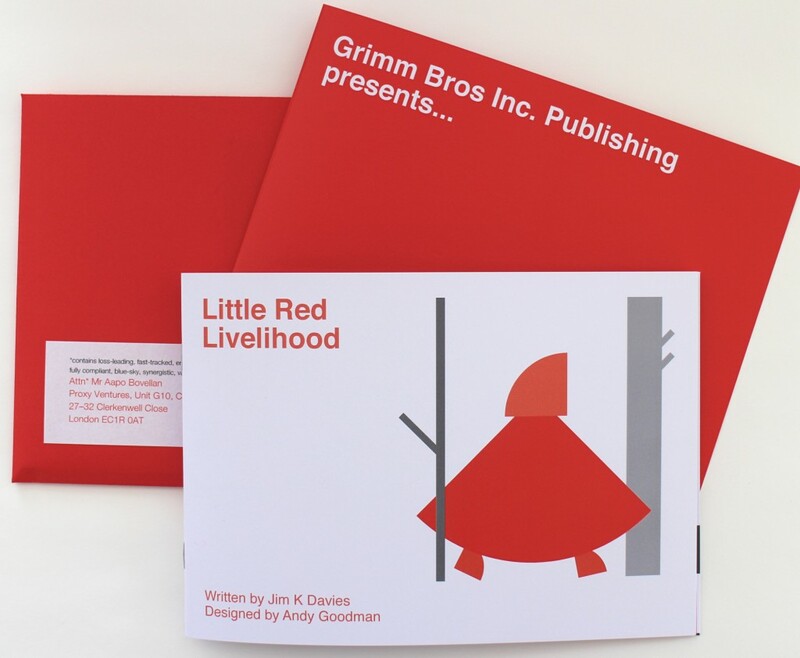 We have a few printed copies of ‘Little Red Livelihood’ left. At just £8.99 (free postage to UK only), this is far better value than an over-priced golden egg. If you’d like to buy one, please use the modern-day PayPal button below. Or for old-school cheque payment, get in touch via mail@totalcontent.co.uk and we’ll tell you where to send it. Both gratefully accepted. loved it! well done both of you…can’t wait for the next one. Cheers Marco, please spread the value-added word! Pingback: Totalcontent | ‘The Three Little Capitalist Pigs’.